The all purpose foot is also called the straight stitch foot, and the standard foot. 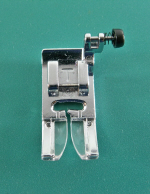 This foot comes with all sewing machines and is therefore considered standard to all machines. This presser foot is the most versatile of all presser feet because it can be used with such a wide variety of stitches. The foot does not look very different from sewing machine manufacturer to manufacturer, and has a very simple design making it easily recognizable. Depending upon the machine, the foot may be one that snaps onto the shank of the machine or one that is attached by screwing it onto the shank. This is the foot used for general garment sewing also referred to as utility garment sewing by some sewing machine manufacturers. The all purpose presser foot is more specifically used to finish seams, hems, and for topstitching. This foot can also be used for patchwork, decorative stitching, smocking and fagoting. This foot is also used with zigzag stitches and stretch stitches, these stitches fall into the category of utility stitches. The stitches this foot is used with are the straight stitch, and zigzag stitches. There are also some stitches considered stretch stitches that are used with this foot. Here are some examples of stitches used with the all purpose presser foot. Here are some examples of all purpose presser feet from three different sewing machine companies.